The People's Republic of China (in Chinese 中华人民共和国, i.e. Zhōnghuá Rénmín Gònghéguó) is a very large country in the east of Asia (the third largest in the world) with a total surface of 9596960 sq. km. China is also with currently 1.3 billion inhabitants the most populous country in the world. Its official language is Chinese although there are 56 distinct ethnic groups, each with its own language. China is one of the oldest civilisations in the world with a history spanning back to 5000 years ago. China originated in the third millenium BC as a series of separate states which were finally unified in a large empire in 221 BC. China has since then been ruled by a series of dynasties until 1911, when it became a republic. The Communist Party of China has been ruling the country since 1949. Currently China is going through a very rapid growth phase with yearly growth rates exceeding 10%, which is rapidly transforming China from a developing country to a developed country. As a side effect of this rapid economic growth, China is currently suffering from a severe pollution problem, with polluted skies and waterways. The continued expansion of deserts, particularly the Gobi Desert, is also a cause of concern. 313 photos of a large and very varied province in the southwest of China. The gallery includes photos of Kunming, Dali, Lijiang, Xizhou and Zhongdian. 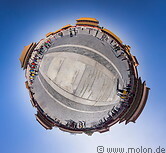 504 photos of Beijing, the capital of the People's republic of China and of the Great Wall. Gallery updated in Oct. 2008 with 62 new photos. 148 photos of China's largest city on the banks of the Huangpu river. 99 photos of a province in southern China, north of Hong Kong. The gallery includes photos of Guilin, the nearby Reed Flute cave, the Li river, Yangshuo and the Yulong He river. 141 photos of Guangzhou and Shenzhen, two boom towns in the southern China Guangdong region.